What event has a greater economic impact on the city than the Flying Pig Marathon and Western & Southern Open combined? That would be the Cincinnati Music Festival. 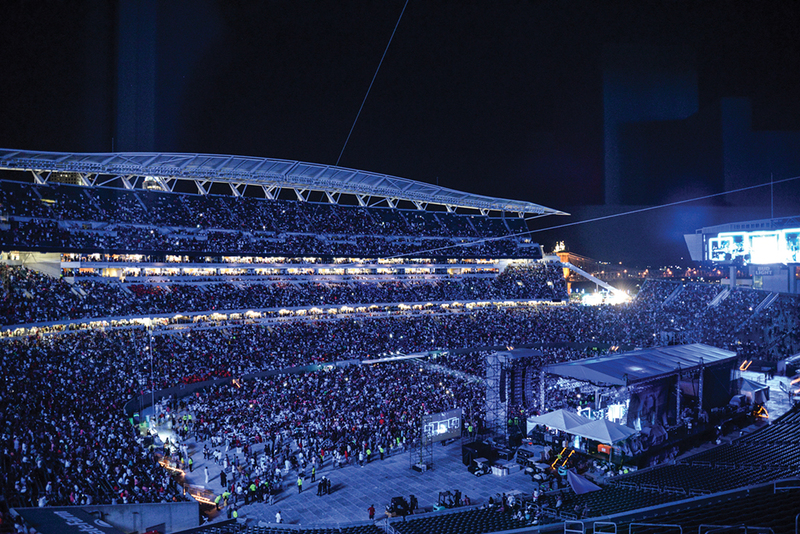 Paul Brown Stadium was packed with concert goers during last year’s Cincinnati Music Festival. Photograph courtesy Santangelo Group Inc.
Fantasia performs on stage at the Cincinnati Music Festival Saturday July 29, 2017. The Cincinnati Music Festival dates back to 1962, when it was originally known as the Ohio Valley Jazz Festival. Over the years it has changed names, including a run as the Kool Jazz Festival and The Macy’s Music Festival, before taking on its current name in 2015 when Procter & Gamble became the presenting sponsor. Now in its 56th year, DiBattista says the 2018 festival is on track to be as big as 2017’s, with headliners including Boyz II Men, Bootsy Collins, Jill Scott, Common, and Charlie Wilson. Next articleWho Would You Least Expect To Find At An 1871 Sabbath-School Picnic In Cincinnati?